This is the perfect automatic electric kiln for high production, with nearly 10 cubic feet of loading capacity. For those who fire the same program for many loads, you need simply to load and start one of your six stored programs, and go back to work on your next batch. The KilnMaster will handle all the firing details with truly superhuman precision, ensuring that you will get superb consistency, load after load. If your 1227-3 is fitted with a Skutt EnviroVent, you can plug all the peepholes, program a Delay to start your firing at night, and be there for shut-off and unloading the next morning. You get more sleep, and much more production. Available in three phase models. Part of the New 22” Series, the KM1222-3 was designed to specifically meet the needs of the vertically challenged Potter or Teacher that needs a kiln short enough for them to easily load, yet large enough to meet the volume needs of a busy studio or classroom. At 22” deep it has a chamber that is 4.5” taller than its predecessor, the KM1218-3. This makes it possible to fire an 18” tall vase with all the proper clearances. It comes equipped with the precise control of the KilnMaster Controller making it easy and convenient to operate. 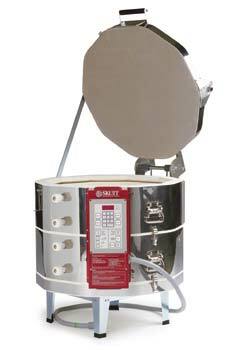 Like all other Skutt 12 sided kilns, the spring-loaded Lid Lifter is included at no extra charge. BIG OPENING — BIG POWER. 6.6 cubic feet of Cone 10 power. Large 28-inch diameter allows for large platters. The KM-1027 is known as a real powerhouse because of its large 7 cubic foot capacity and ability to fire to Cone 10. 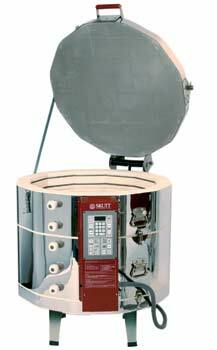 It is a great kiln for those who fire porcelain and stoneware. It has proven to be the most popular model in our KilnMaster line, and has earned a reputation as a kiln which fires evenly at high temperatures over and over again. Again, the addition of the Skutt EnviroVent will help get the most from this kin’s automatic firing capabilities. Also available in three phase models. Part of the New 22” Series, the KM1022 was introduced to combine the benefits of the easy to load KM1018 and the desirable height of the KM1027. At 22” deep, it has a chamber that is 4.5” taller than its predecessor, the KM1018. This makes it possible to fire an 18” tall vase with all the proper clearances. It comes equipped with the precise control of the KilnMaster Controller making it easy and convenient to operate. 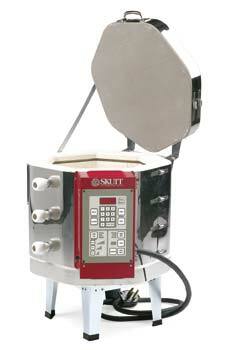 Like all other Skutt 10 sided kilns, the spring-loaded Lid Lifter is included at no extra charge. For easy loading of heavy or fragile pieces, you can’t beat a Skutt KM-1018. This kiln gives you nearly five cubic feet of capacity in a nice wide firing chamber. Whether the task is delicate porcelain or heavy stoneware, the KM-1018can take you all the way to Cone 10 using cone equivalents or your custom designed Ramp/Hold program. 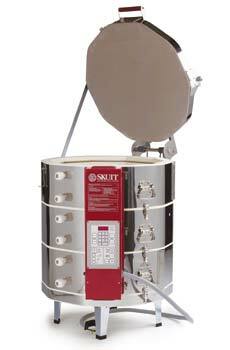 As with all our larger automatic kilns, the Skutt EnviroVent gives you one-touch firing with all peep holes plugged. Part of the New 22” Series, the KM822 offers 4.5” more height then the KM818. This doesn’t sound like much until you need to add another shelf or want to fire a taller pot or sculpture. Fire a 18” tall piece with all the proper clearances. The 22” height coupled with its Cone 10 capability and small space requirements make it a perfect kiln for the home studio.It comes equipped with the precise control of the KilnMaster Controller making it easy and convenient to operate. Also available in model KM822-3 with energy saving brick. 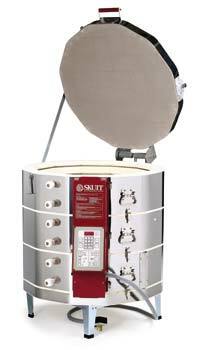 Now your friendly eight sided Skutt electric kiln can give you precise firing control that was available only on top of the line models just a few years ago. It is a versatile Cone 10 kiln that is a great work tool for porcelain and stoneware artists. Easy to move and economical to operate, the KM-818 is the perfect kiln for home studios, too. Porcelain doll makers love the KM-714 because it can handle the components of most dolls in one load, and because it gives them better firing control. For studios firing one or more of our larger KM-series kilns, the KM-714 makes the ideal test kiln, because they can replicate firing programs precisely, regardless of the size of the kiln. 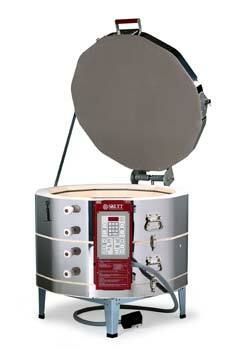 The KM-714 electric kiln operates universally on 208V or 240V current. 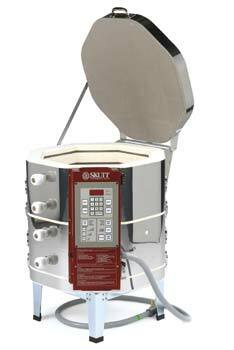 The KM-614-3 is the only electric kiln in the KM series that can be fired on common household 115C current using a special 30 Amp outlet. It is exceptionally handy for artists with limited space at home. The beginner can begin firing immediately – without a collection of pyrometer cones – and achieve consistently good results. Unlike many smaller kilns, it is a precision device suitable for serious jewelers and doll makers. Please know the voltage and phase before calling to order your new kiln. The Dawson KilnSitter has proven itself as a reliable way of controlling kilns for more than 50 years. 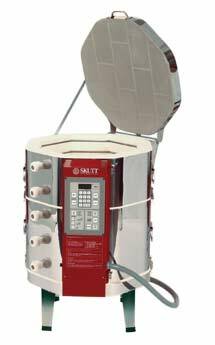 The temperature and heating rate of KilnSitter (KS) Kilns are controlled by switches which you turn up in intervals which are determined by how fast or slow you wish to fire the kiln. The KilnSitter uses pyrometric cones to measure the heatwork inside the kiln. 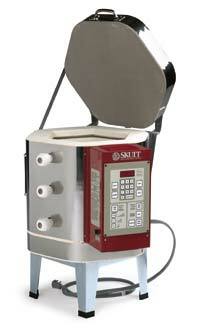 When the the pyrometric cone begins to melt the KilnSitter automatically shuts off the kiln. A unique feature of the KilnSitter line of Skutt kilns is that most models can be expanded by inserting a 4.5” brick ring between the sections. This ring can be added or removed between firings as space requirements vary. An optional safety timer is also available to help prevent accidental overfires.